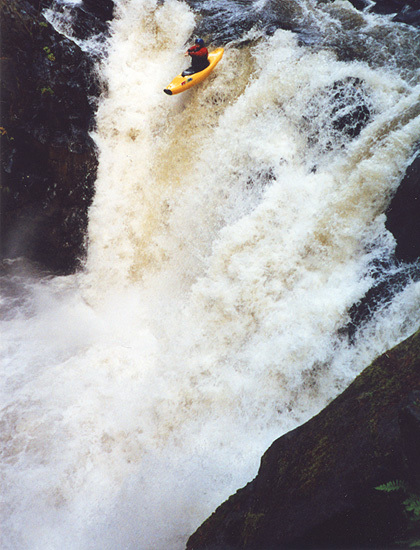 Copyright © 2001,2006, Oregon Kayaking. 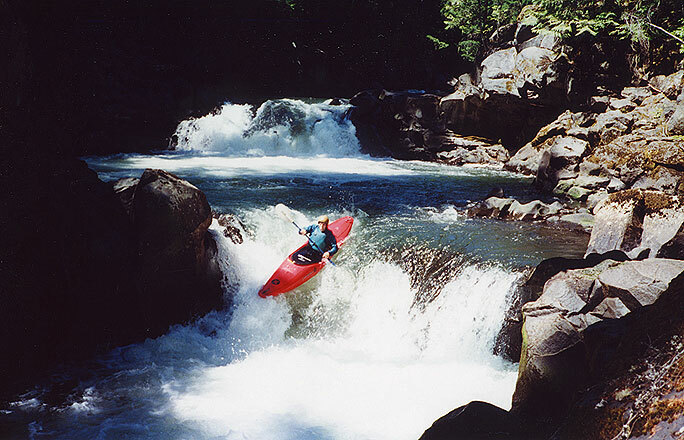 No part of this page may be reproduced, linked, or copied without the express written permission of the Oregon Kayaking Webmaster. 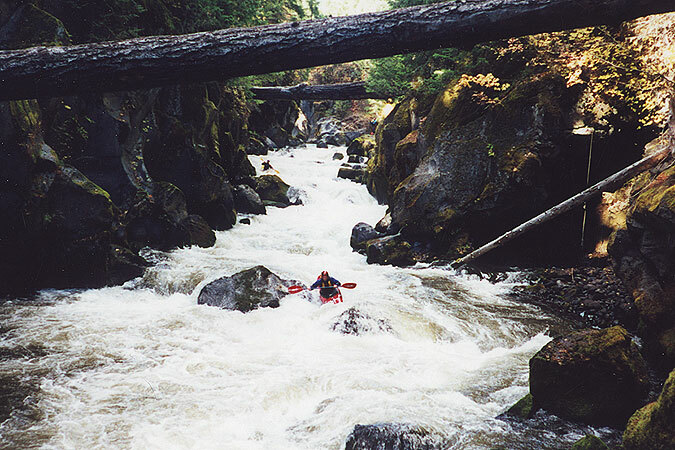 The Green Truss section of the White Salmon runs year-round and has long been a proving ground for Northwest paddlers. This run is always class five except in the fall when the levels drop to around two feet and it eases to IV+. Green Truss is a great summer paddle because when just about everything else is dusty this section is still roaring down through a deep canyon with great rapids that draw adventurous paddlers like bees to honey. Dan Coyle once told me that "Green Truss has holes that just won't let you go if you get into them, and that is my definition of class five." If you have done the Farmlands section of the White Salmon you have probably looked downstream at the river meandering lazily around the corner and wondered what was down there. Well, lets just say nobody waits for action on this run! As soon as you turn the corner there is a clean horizon line which leads to the first in a long series of fun class III-IV drops, each with calm pools between allowing for easy boat scouting. 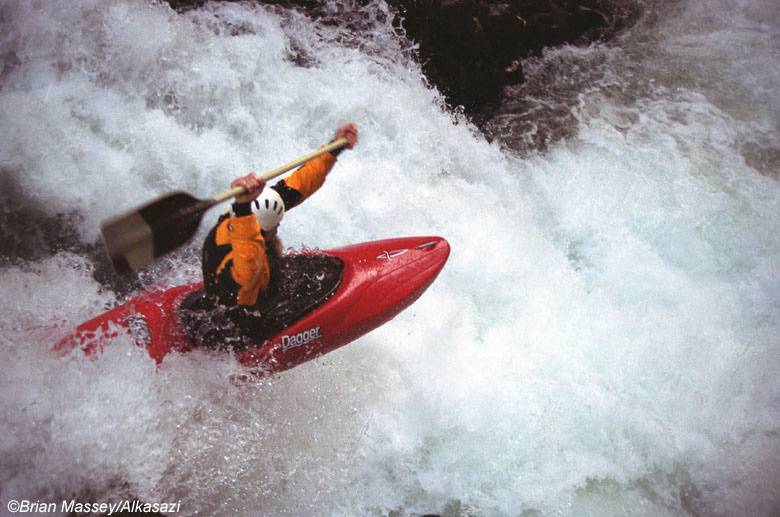 Somewhere in the middle of this barrage of easier drops is the Meatball, a two part rapid that requires a leap of faith through the right side slot around a huge boulder blocking most of the flow, or a fun boof if you go left. Just below the Meatball is Bob's Falls. This sloping ten foot drop resembles a low head dam and plunges into the first of many menacing holes that this run is known for. 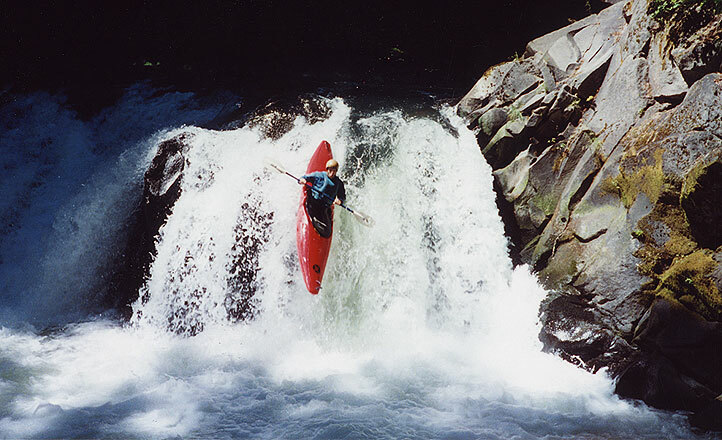 Left with left angle is the best at medium flows... John Whaley does it right at Bob's Falls. The pool-drop action continues below Bobs. A couple of drops below Bob's the river forms a large pool above Big Brother, a 25 foot waterfall. Big Brother is regularly run but it has some danger spots. There is has a cave on the right just below the falls that has taken the life of one very experienced kayaker and temporarily trapped many others. The pool on the left side also has shallow spots that have broken boats, legs, backs, and ribs. The lead in to this drop is very tricky as the current flows strongly parallel to the lip of the falls which makes hitting the crucial three foot wide boof flake harder than you might think. On one recent trip nine boaters in the group ran Big Brother. Of the nine, five ended up in the cave and two hit the bottom..
Josh Bechtol cleans Big Brother. ( This is pretty much where you have to be on this drop ). Mark Stuber soars over Big Brother. Looking into Big Brother during a recent winter run. Just below Big Brother is Little Brother (aka The Faucet) which is one of my favorite drops on this river. 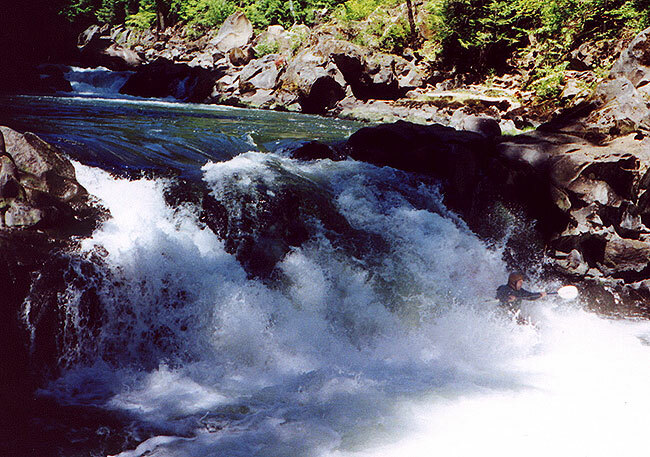 This fourteen foot falls is so much fun we usually do a few laps on it, and in a modern high volume creekboat you can run this one any way you want. That said, a paddler broke his boat on the bottom here back in the eighties so if you are paddling a longer old-style kayak you might want to boof with right angle. John Whaley sails over the Faucet. Below the Faucet there are a couple of smaller rapids leading up to Double Drop, a class V eighteen foot double falls that plunges down through two huge holes. Those not familiar with the river be careful as you approach this one, especially when the river is high. There is a rapid leading right into Double Drop, so keep an eye out. Double Drop is usually pretty forgiving, unless you fall into it sideways. I've seen people run this drop backwards, upside down, upside down and backwards, and I've only seen one person get worked here. Here are some pictures of one boater getting worked hard at Double Drop. Suffice it to say that if the river is running over three feet stay right after Double Drop or you may end up getting stomped hard by that hole like I did. ( click here to see Ryan Scott's video of some carnage at this hole ). Just downstream from this drop paddlers experience a phenomena unique to this run as numerous springs start to cascade into the river, nearly doubling the flow in a very short distance. 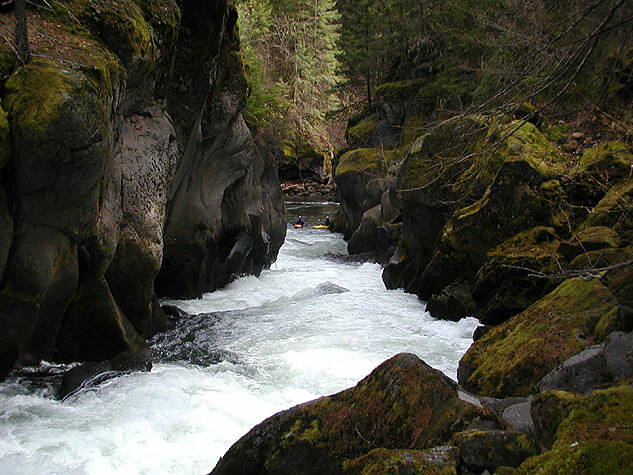 Your first time down this part of the river you won't believe your eyes as you float past cascades of water bursting from cracks in the rock walls- It's an incredible sight! The downside is that the water temperature drops as well.. If you thought the river had push before, you haven't seen anything yet! Downstream from Double Drop the rapids start to get bigger and bigger as you approach Zig Zag canyon. The big stuff starts again when you see a large rock formation on the left formed out of an unusual cobblestone lava rock similar to that seen on the WF Hood. This drop ( known as Cheesegrater ) has some twisty routes past an undercut wall..
Jason Schroeder runs Cheese Grater during a recent winter trip. 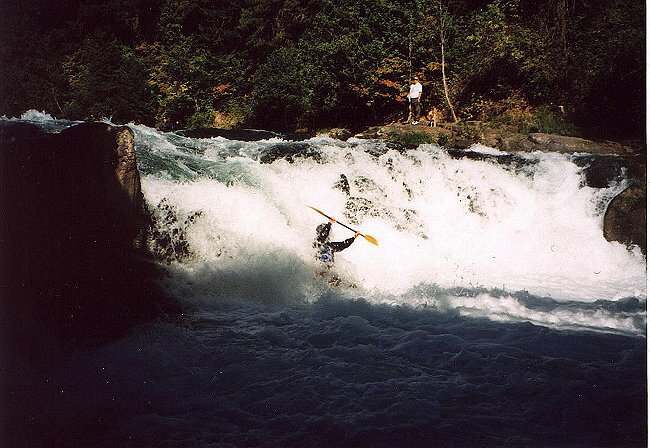 Immediately below Cheesegrater the river narrows down and goes around a right corner into a drop John calls 'Unavoidable' - here you round the corner and plunge through some wild hydraulics and offset holes that are usually not a problem if you build up plenty of momentum. The boils here are big and funky, so I always start paddling fifty yards upstream from this one and don't stop until I'm in the pool below..
Below Unavoidable the river eases slightly as you approach Upper and Lower Zigzag Canyon. These drops can be portaged but it would be very difficult as the cliffs are high and the rapids are long. On one trip a paddler decided to portage Lower Zigzag and it took 45 minutes and involved some creative ropework. If you don't run 'The Big Three' ( Big Brother, Double Drop, and BZ Falls ) then Zig Zag canyon will be the crux of the run for you. EJ Etherington enters upper Zig-Zag. The bottom half of Upper Zig-Zag. Generally the middle boof is best here..
Just below Upper Zig Zag is a large pool which allows you to get out and scout Lower Zig Zag rapid. This drop is long and complex and must be scouted on the left as it contains dangerous undercuts and a cave on the bottom left wall. Lower Zig-Zag changed dramatically in the flood of 1996 when a boulder shifted, creating what is now known as 'The Move'. 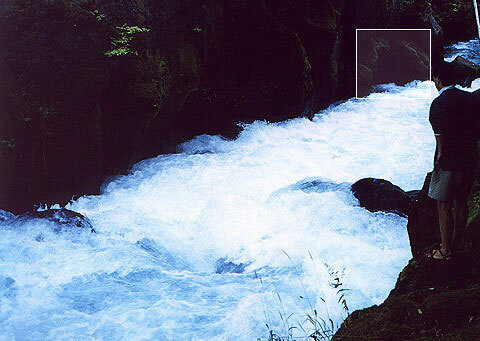 The rapid changed again in the floods of 2003, when the left side boulder forming 'The Move' washed away, dramatically reducing the difficulty of this rapid. The current version of Lower Zig-Zag can be run along the left wall; in the photo below, the boulder against the left wall is no longer there, so you can stay left the whole way down. Both of the photos on this site are of the 1996-2003 version of Lower Zig-Zag, but you get the idea. Pete Giordano scouts what used to be 'The Move' slot on Lower Zig Zag. Just under where he is standing is an undercut slot, and on the left wall is the cave (highlighted). 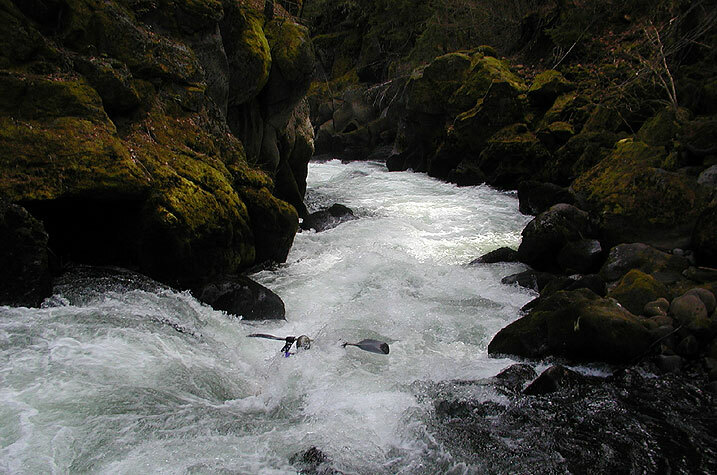 Two paddlers running Lower Zig Zag viewed from downstream; the entire rapid is visible here. Below Zig Zag the river eases to class three for awhile but there are some drops to watch out for. 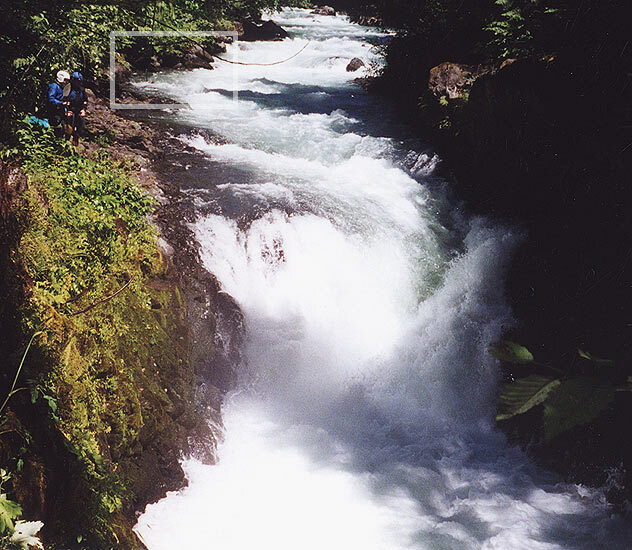 Three or four rapids below lower Zig Zag is a small ledge some call 'The Sticky Hole.' 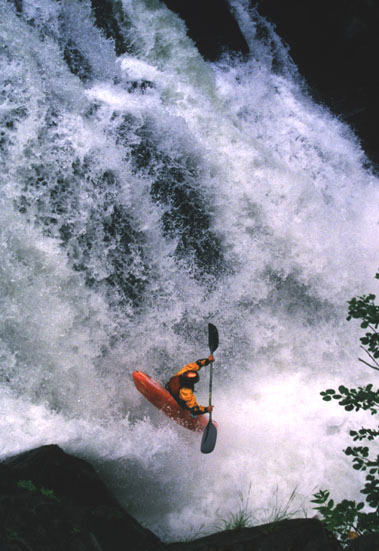 This drop should be boofed on the right in order to avoid the meat of the hole, which has been known to surf rafts for up to five minutes at flows around three feet. 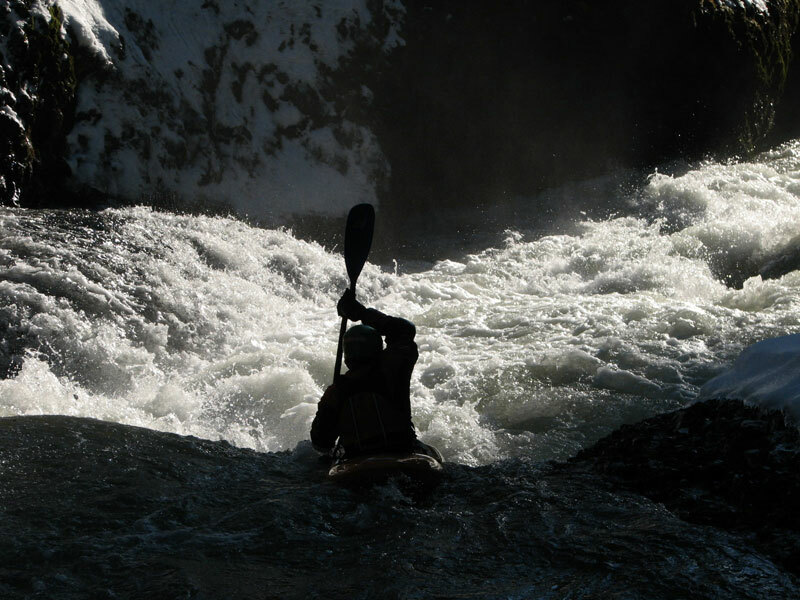 Soon paddlers reach 'The Flume', a fun drop that is best at very low flows. This drop is signaled by several water pumps on river left just downstream from a large horizon line. Just below The Flume stay on your toes as you approach what is by far the most dangerous drop on the White Salmon- sixteen foot BZ Falls. Dave Mustonen and Josh Knapp scout BZ falls. 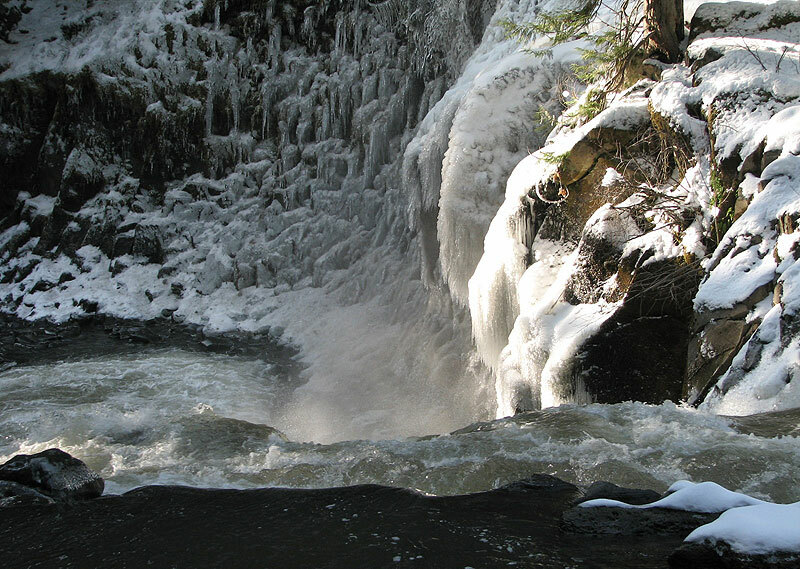 I highlighted the first of three small eddies above the falls that you must catch in order to portage this drop. BZ Falls is by far the burliest drop on the White Salmon but lots of boaters run it these days. Three people have drowned here, all paddlers of some sort but no hard shell kayakers that I know of. All lost their lives when they ended up in the horrific hydraulic/undercut combination at the base of this falls. BZ Falls from the front. 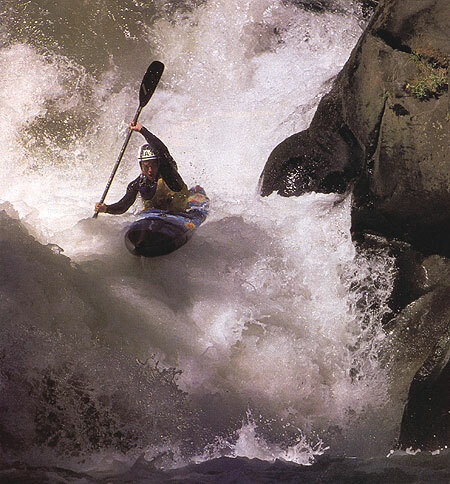 Paddler, Dave Grove. Below BZ the river is class II until you get to the take out at BZ corners, though we sometimes sprint seven extra miles downstream though the Middle section to Husom falls for a little extra exercise.